Chadwick Optical, Inc. Fitting and Prescribing the Permanent Peli Lens - Chadwick Optical, Inc. Patients who like the temporary prisms can get 50% more field expansion by getting a pair of glasses with embedded PMMA acrylic Peli Prisms. Chadwick Optical has developed several products to smoothly transition your patient from temporary press-on prisms to a permanent prism. We try to design systems where the prisms can easily be removed in situations where the prism brings little to no benefit. Each of the options are outlined below. 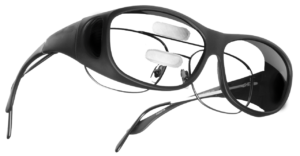 Make the Peli Lens Configuration more versatile with Peli Lens Clip-on frames by Aspex Eyewear. 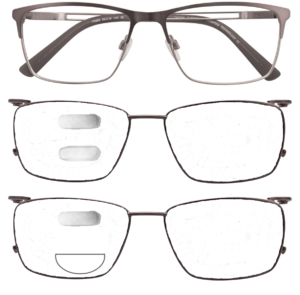 We can make special lenses for both the inside lens (in the frame) and the outside lens (in the clip). You can even have clips made for different situations. Here are a few configurations that we’ve used. 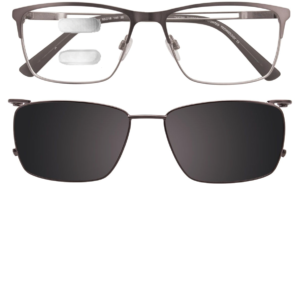 Single Vision or Bifocal RX/Clip 1: Horizontal Prisms for Mobility/Clip 2: Oblique Prisms for Driving Click here to view the available magnetic clip-on frames. Our Peli Lens Fitovers meet many of the same needs as the magnetic clip-ons, but at a fraction of the price. These are a one-size fits most design. We recommend you keep one of these in the office to show patients the benefits of the permanent prisms. For patients with a light RX who don’t normally wear glasses. See Frame Selection area below for information on selecting an appropriate frame. A small sliver of bifocal placed below the bottom prism to be used for light amounts of reading. We would recommend that the patient get a separate pair of reading glasses. Forego the bottom prisms, and just have a top prism. This would be for the patient who considers reading to be of the utmost importance. The Peli Lens can be manufactured in CR-39, mid and high index. The lenses are made with a minimum center thickness of 3 mm. This extra thickness is required to maintain rigidity through the lens milling process. We cannot use polycarbonate or Trivex because they are soft, flexible materials and do not hold up in the milling process. Photochromic and polarized lenses are available, but the PMMA insert cannot be tinted. If a sunglass solution is important to the patient, we would recommend a configuration that involves the magnetic clip-ons. Because of the lens materials available, we can only use nylon rimless and full-rimmed frames. If you send a nylon rimless frame, we will provide a high index lens to minimize the possibility of chipping. We recommend the frame have nosepads. This allows for minor adjustments to optimize the heights of the prisms. We cannot overstate the importance of selecting a properly dimensioned frame. To help you select the proper frame, we’ve created a sticker template to assist in frame selection. This template is included in the Peli Lens Fitting Kit. The template is designed with a 12 mm separation, and includes a border for the frame. The red outline on the sticker must not go beyond the edge of the lens. It has a minimum B measurement of 36 mm. 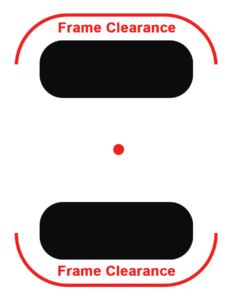 There are 18 mm of frame above and 18 mm below the pupil height.